David Bowie won Best British Male at last night’s Brit awards. Kate Moss collected the trophy on his behalf, wearing one of Ziggy Stardust’s original outfits (pictured left). 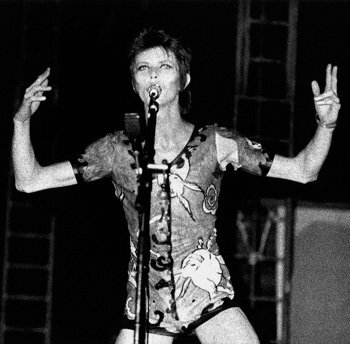 The ‘Woodland Creatures’ costume was designed by Kansai Yamamoto and worn at Bowie’s concert at The Rainbow Theatre on August 19th 1972. Left: © Masayoshi Sukita, taken from SPEED OF LIFE.